In Barons of the Galaxy you will start a corporation somewhere in the starting solar system of Sol by placing your Corporate headquarters. There you will begin to mine resources and produce other goods that are to be sold to the nearby cities for profit. Resource locations have different values, transportation and political factors to consider. Higher level products require several varying sets of resources to manufacture and often require cooperation and trade with other corporations to be profitable. You should also realize that nearly every asset your corporation owns, structures, military units and even stagnant product, has a significant upkeep cost associated with them which can un-expectantly overwhelm novice players and force them into bankruptcy. These considerations and how well you manage them will be the foundation to your success or failure. As you profit from your sales you can expand your corporation by producing more and more structures and construct several types of military units. You should expect to be affected by random events in your local area which occur on a regular basis. These events can significantly, although usually only temporarily, affect your game for better or worse. You will also be involved in voting for different outcomes of events that affect the city or planet you are in. Many of these events have a cooperative or competitive quest-like nature them and are often tied to a particular industry which you may be involved in. How you handle yourself through the changing market values of your products as well as interact with the other players who are also using their influence to affect events is the foundation of the game play in Barons of the Galaxy. Barons of the Galaxy is not played in real-time, it is turn-based, which means you spend most of your time setting structures to produce different things or setting your military units to transport and sell resources in a loop and then watching the results unfold over time. Most of the interface is designed to give you an overview of what is happening with the prices of goods and the activities of the other players around you. Event and even combat are not resolved instantly usually giving you plenty of time to be notified and react appropriately over the next few turns. There are 5 major tabs to the game interface. Each one will be explained below. The Viewscreen tab displays the galaxy and allows you to zoom in to any location by clicking on it. The controls on the right allow you to zoom out, move one space in any direction or search for anything in the galaxy by name. There is also a navigation trail which shows you which areas of the galaxy you are currently looking at. The "Overlay" checkbox toggles an overlay so you can easily see the grid of locations. It also shows a thick line on planets to show you were the boundary for ground units is. Just above these controls are three small buttons which are used for bookmarking locations. One allows you to enter the current location as a bookmark, the second toggles the list of all your bookmarks and the third toggles whether the bookmarks are displayed on screen or not. Overview - Shows general information and statistics about the area you are looking at. It shows totals for city populations, resource, industry, demand and military units. It also shows a grid with the top 10 areas by population. It also shows colored corners in location in which your corporations has assets. Gold for Military Units, Green for products, Blue for structures and Violet for items. Resource - Shows a count and value of all the resources in the area you are currently viewing. The 18 resources are represented by small colored tick marks within each location. You must be zoomed in to the planet level to see the actual locations of the resources, otherwise you will get a sum by area depending on how zoomed out you are. The Top 10 grid will display the areas with the most resources or it can be set to specific ones via a "Order" dropdown. Industry - Displays the count of structures and total production of every product being manufactures on the Viewscreen. Every area with industry is represented with the top half of a hexagon which is colored from red to green indicating the highest to lowest amount of production relative to each other. The grid in the upper left can be used to filter the numbers to a particular category or down to a specific product. This will filter the top 10 grid as well. The numbers represent a sum of the entire area you are looking at on the Viewscreen, but the top 10 grid shows the specific values for the locations inside of it. At the planet zoom level you will see specific values for individual cities on that grid. Demand - This tab shows the sum of demand and volume of every product in the area currently on the Viewscreen. Just like the Industry tab, you can use the grid in the upper left to filter the numbers to a specific category or down to a specific product. The top 10 grid as well as the hexagons on the Viewscreen will change automatically. It is important to realize that the Demand displayed is an average for the entire area on the Viewscreen and the volume is a sum of all the volume. The top 10 grid shows specific values for all the areas inside the Viewscreen. At the planet zoom level and with a specific product selected, the top 10 grid will show the actual demand for those products at those cities. Military - The Military tab displays counts and power levels of all military units in the area. The Viewscreen will be overlaid with green arrows showing the current direction all the units are moving or a small square for the ones that are not moving. The ticks become darker shades or red to represent higher totals of military power. The Asset screen is where you can see and manage all of your structres, ships, ground units, products and items. On the left side are search controls, you can enter an assets name or filter the asset list by categories. Clicking on an assets name on the grid will take you to a details page where you can do different things depending on the type of asset. At the top of the screen you should see an image representing the asset and next to it you will see the assets statistics if appropriate. For Structures and military units you will see the assets name, its type, the cost per turn to maintain and also a set of attributes such as Hit Points and amount of space it occupies. Military units will also show attack, movement, cargo and hangar bonuses. Depending on the asset type you will also see one or more of the following tabs which are explained below. Manage - Under this tab you can rename your asset, salvage it for half its value or upgrade it to the next level if available. Production - This tab allows you to select what product the structure will produce. You must have the appropriate structure to mine different resources; A Farm structure can only mine a Fields resource for example. Several different resources can usually be mined from a single resource types. For example, 20 different kinds of fruit and vegetables can me farmed from a Field location. Buy/Sell - Structures that produce goods can also buy or sell goods from the local city they are located in if one is present. Structures can buy or sell at a rate of 100 at level 1 and scaling up with higher levels. Orders - Military units (Ships and Ground Units) are given orders in a queue in order to move, fight and buy or sell products. For example, transport units are usually give orders to pick up products at one of your structures, then move to a city, sell those products, move back and then a final order is queued to loop back to the first order. Cargo - Displays the products or items the unit is carrying along with its quantity. Display Logs - Shows any important messages attached to this unit. More Info - Display detailed description as well as combat values for appropriate assets. Overview - Shows a summary of your corporations profits and losses over the last 25 turns in the form of a graph. It also shows donut charts that display your profit and loss in the form of percentages. This screen also shows a snapshot of your net worth, your industry military units and any titles you possess. Corp HQ - This screen is where you can re-locate your Corporate Headquarters. You can also customize your corporations’ name, jingle and upload images of your logo and character avatar. Accounting - Displays every monetary transaction your corporation is making, by what asset and where. There is a dropdown list to select different view options. Contracts - Manages trade contracts with other corporations. You can create / edit / re-negotiate contracts as well as browse public offers made by other players. 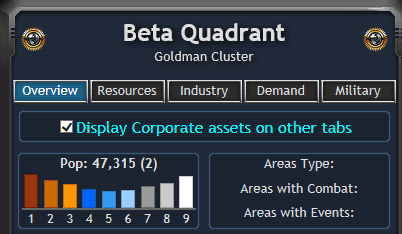 Reporting - Several different graphs to help you visualize the trends your corporation is making as well as other players and the entire galaxy. Politics - Manage your influence in the political arena and view any outstanding votes or elections that affect your corporation here. Companies - This is a search page for other corporations you may want to make deals with. You can filter searches by industry, location and other characteristics. When queuing up orders for an asset, usually a military unit or transport, you may link some orders to a custom variable you have created to make it easier to change several orders across different units at once. For example you can go to Assets >> Manage Variables and create a "MyDelivery" variable for a Location (let’s say a delivery location of New York that your transports loop to) then set that variable in several different units Move To Location order. Now when you want all your transports to loop into Houston instead of New York you can you can go to Manage Variables and edit the coordinates of your "MyLocation" variable. All orders linked to that variable will change to the new location if possible. If you attempt to update a variable that would set an order or structure to something it cannot do, for example a Chemical Factory with a variable set which changes to Cotton, that asset simply will not be updated. You can set custom variables for Locations, Product Types for Production, Buy, or Sell order, and Production Rate for Structures. Orders that are linked to a variable will typically display "(x)" to signify they are linked to a variable. It is possible to set an order or structure to something different than what the variable it is linked to is showing. Such an aasset will change back if the variable is updated for any reason. There is a simple forum style communications tab in which you can send direct messages to eachother or post publicly in "Channels" that are attached to every System, Planet and City that is created in the game. The features will be simple and access limited. Free accounts may not be able to post outside the cities they are based in and be limited in posts per day. Posting at the planetary or system level may be reserved for rulers only. Events will also post messages in this system. The Tutorial tab will guide you through the first few days of setting up your corporation. Once complete, it will offer a searchable guide on every aspect of the game.